What kind of information will I find in Office Delve for iPhone? In Delve, you'll find documents that you and your colleague are working on. Documents stored in OneDrive for Business or in Sites in Office 365. You'll only see content that you have permission to view. Office documents (Word, PowerPoint, Excel) and PDFs that have recently been shared with you as attachments in emails. You'll only see attachments if you're using Office 365. You won't see attachments in email messages that are protected with Rights Management Service (RMS). What can I see on the different pages? Documents that are likely to be most interesting to you right now. It's often a mix of documents you worked on yourself and documents that are active among people you work with. The Home page is personalized to you. Other users will see other documents on their Home page. Some of the people you're connected to in the organization, or people you work with across teams. Documents you've added to your favorites. 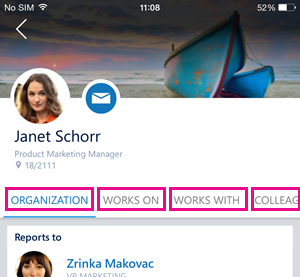 Tap a person's name or picture to see documents that the person works on, other people the person works with and documents their colleagues work on. How does Delve show a document? Delve shows each document as a content card. The information on a content card helps you understand why a document is interesting or relevant to you. The image on the card is extracted from the document, and will often give you a hint about what the document is about. 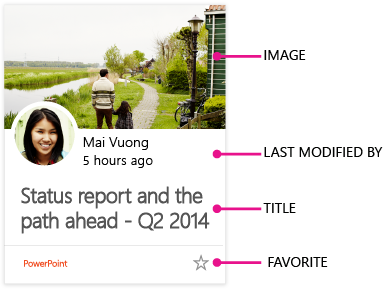 If a document has several pictures, Delve shows one based on things like resolution and size. The last modified by information shows who last modified the document and when the document was last modified. 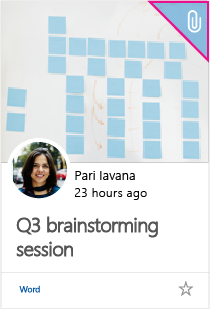 The title on the content card is key to finding or discovering documents in Delve. Icon to mark document as favorite. If the document is marked as a favorite, the icon is yellow. Documents that have been shared with you as attachments in emails have a paperclip in the top, right corner of the content card. Tap the document that you want to share. How can I edit a document? Tap the document you want to edit. How can I add a document to my favorites? Tap the star on the document you want to add to your favorites. You'll find all your favorites on the Favorites page. To turn off notifications, tap your phone's Settings > Notifications> Delve and uncheck Allow Notifications.